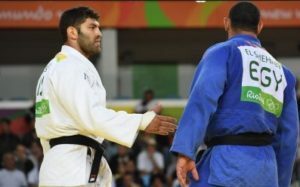 When Egyptian judoka Islam el-Shehaby lost to Or Sasson in the 100-kg judo contest at the recent Rio Olympics, Shehaby demonstrably snubbed his Israeli opponent by refusing to shake hands, as is Olympics protocol (not to mention just plain good manners). This prompted outrage – not only in Israel, but at the International Olympics Committee, which reprimanded Shehaby, as well as by Egypt, which sent him home. The slight highlights the gap that frequently exists between official diplomatic relations – Israel and Egypt have a peace treaty, after all – and the sadly less favorable opinions held by many individual citizens. It goes both ways, of course, and it’s not my intention to make a blanket statement about all Egyptians (or all Israelis for that matter). Still, the incident in Rio wasn’t entirely surprising to me. 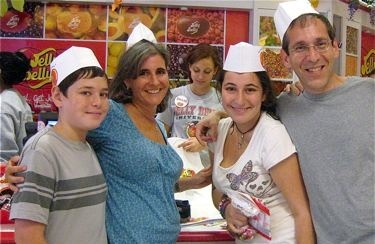 Eleven years ago, our family spent a week touring Egypt and had a similar experience. Ahmed, our tour guide, clearly didn’t know what to make of us. He definitely realized that something about this typical “American” family was odd. We showed a surprising amount of interest in Cairo’s Ben-Ezra synagogue, where our kids read the inscriptions in fluent Hebrew. Our strictly vegetarian diet (our way of keeping kosher while on the road) was way off the beaten track in meat loving Egypt. Most of all, our oldest son’s name was highly unusual. We hadn’t concealed the fact that we were Jewish. But we nevertheless decided that we would travel on our U.S. rather than our Israeli passports, and when asked where we were from, we would answer “California” (not entirely untrue since we moved to Israel from the San Francisco Bay Area). Before our trip, an Egyptian friend – a software developer I have worked with in the past – assured us that Egypt was safe. “Just don’t go around with a big sign reading ‘Hi, I’m an Israeli,’” he said. We decided to heed his advice. 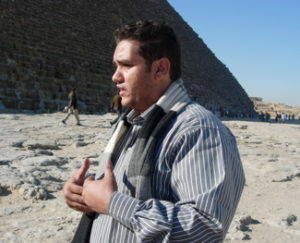 Together with Ahmed, we climbed the pyramids, ogled the Sphinx, marveled at the mummies in the Egyptian Museum and caught a glimpse of Tahrir Square, which had yet to become famous as an international flashpoint. As we crossed the “6th of October” Bridge, commemorating Egypt’s perspective on the Yom Kippur War, Ahmed decried violence of all kinds, stressing there were only losers in conflict. We were ready to open up. That is, until he addressed the elephant in the room. We decided we’d remain closeted until the end of the trip. Upon our return to Israel, though, I was unsettled. I felt we had truly enjoyed each other’s company; that we could have become friends and not just customers given a bit more time. But that would require honesty. “What would you say if I told you we were not only American but Israeli citizens as well?” I wrote. A full week went by without a reply. I fretted. Maybe he was leading a tour down the Nile without good cell phone coverage, I comforted myself. Or maybe the time was not yet ripe to be so forthcoming. Finally, a message appeared in my Inbox. The subject line read “Warm regards.” I was momentarily buoyed. But I was not willing to let it end there. I wrote back, attaching several photos from our trip. This time, Ahmed’s response came the next day. I wrote about Ahmed originally at The Jerusalem Post.